Sadly, every night of this pop-up for upcoming film The Happytime Murders is sold out. The InkHole is a pop-up tatoo parlor, but it's also a speakeasy. 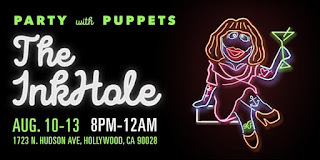 It looks like they"ll have puppets doing some naughty stuff on stage, while you grab a drink. The movie isn't due until the end of the month, but we're still looking forward to it. We'll update you on any special Q&A screenings we see pop-up.